LENEXA, KAN. – Back in 1883 a timber-framed Standard Pennsylvania style barn was constructed with a real slate roof on the homestead of the Hartong family, located in the City of Green, Ohio. After more than a century of service, the worn out slate roof — and the rotting wood structural support system beneath it — have finally received a facelift. The next step required gaining approval on the roofing choice by the City of Green and the Ohio Historic Preservation Office (which awarded a grant to finance the roof’s replacement). Once given, the project started. Christian & Sons, Inc. was brought in to replace the rotting timbers, and Absolute Roofing started the roof installation. 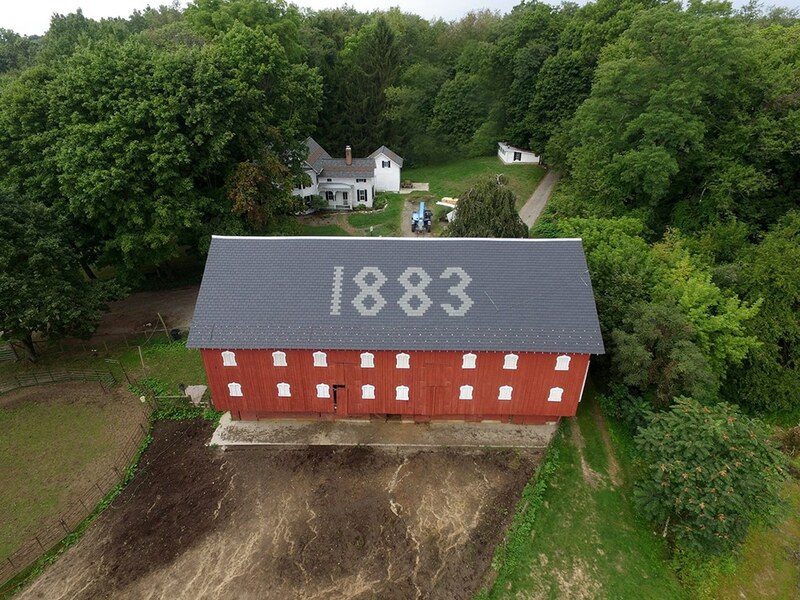 The challenge of recreating the 1883 date on the roof, plus detailing the entire roofing job for the Hartong barn, required a great deal of collaboration between the team at Absolute Roofing and Construction, Inc. and Braun & Steidl Architects. Started in the spring of 2016, from start to finish, the roof frame reconstruction and tile installation took about six months. “There were two significant challenges in this project,” says Chris Kamis, president of Absolute Roofing and Construction, Inc. “First, we were working alongside the framing team to make sure the structure was secure and ready for the roof installation. Second, we had to configure the 1883 date carefully. Reflective of the Pennsylvania German heritage of the Hartong family and the community in the 1880s, the 45-foot by 90-foot timber-framed barn rests on a tooled sandstone foundation. Finished with vertical wood boards, the barn is owned by the City of Green and is part of the Levi J. Hartong homestead that includes a farmhouse, summer kitchen, milk house and other out buildings.